The scorching heat of summer is here, and one thing calls us – a beach getaway! I myself am not a swimmer or a diver, but this recent hi-tech discovery of mine will surely win the hearts of aqua masters. It’s called the Bladefish Underwater Scooter. 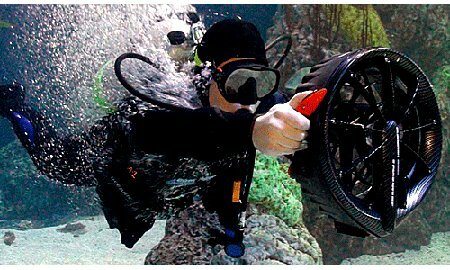 I’m sure most of you will agree that scuba equipment is hard to store at home when not in use, precisely because of its huge size. Not to mention the weight of the item, bringing it to diving trips makes it very cumbersome and costly (say, airport fees). The Bladefish Seajet Underwater Scooter is a total opposite. It has a completely wonderful design and concept. At first glance, you’d quite give a doubt that something of its size, dimension, and weight would be able to pull a diver through the water. But it does! A specific model called Bladefish 5000 runs at a power of 240 watts with a battery of Lithium Ion 18V. 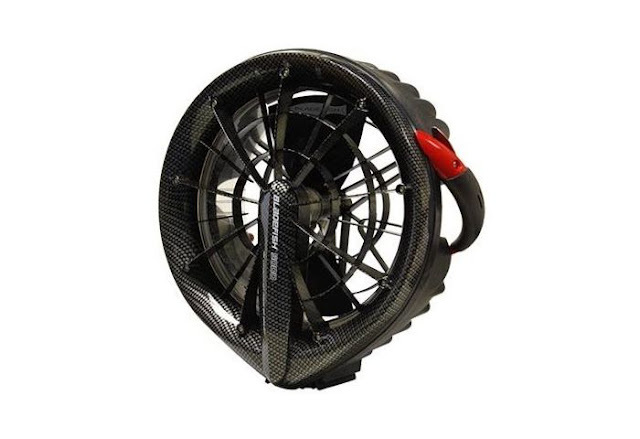 It is capable of turning a whopping maximum of 550 revolutions per minute, which allows towing of the diver through the water at a maximum speed of 5.25km/h of up to 40 meters in depth. With its speed and power, you would think that the battery could easily die down. But no, this lightweight gadget at 4.9kg can last between 45 to 120 minutes, depending on usage. Its built-in battery indicator gives an ample time to safely go up from the dive before it dies down. It’s also amazing that such a powerful device can get fully charged after only a short 3.5 hours, which is just enough to take a break from the first dive. Another advantage of Bladefish is its usage of Lithium Ion battery. Such batteries can be designed to fit most dimensions. It deviates from old scooters designed with a power supply, which means that there’s no longer a need to endure bulky, heavy, and extremely poor batteries. In addition, Lithium Ion batteries does not have a “memory” charging, therefore allowing divers to charge it any time without having it fully discharged first. The Bladefish Underwater Scooter is very much ready for packing and travelling. With a dimension of approximately 38 cm x 36 cm x16 cm, it could easily be packed in a carry-on bag. It is very much ideal not only for divers, but also for kids playing at the beach, lake or pool. For a non-swimmer like me, Bladefish has done a fantastic job of taking the underwater propulsion vehicles to a notch higher, making every diver thrilled to include it as one of the diving gears. Surely, this summer would be extra techie with an underwater scooter such as this. Bladefish 5000 sells for about $698 to $820. This article is my 59th contribution to Manila Bulletin -- one of the Philippines' leading broadsheets -- published on March 30, 2012 (Friday) in the special quarterly supplement of TechNews entitled 'Digital Generation.' You can view the PDF version here. Hi I am looking online for some scooter luggage online. to buy a ride on luggage this time. Please suggest me some options.